SELL FASTER, and at a HIGHER PRICE! 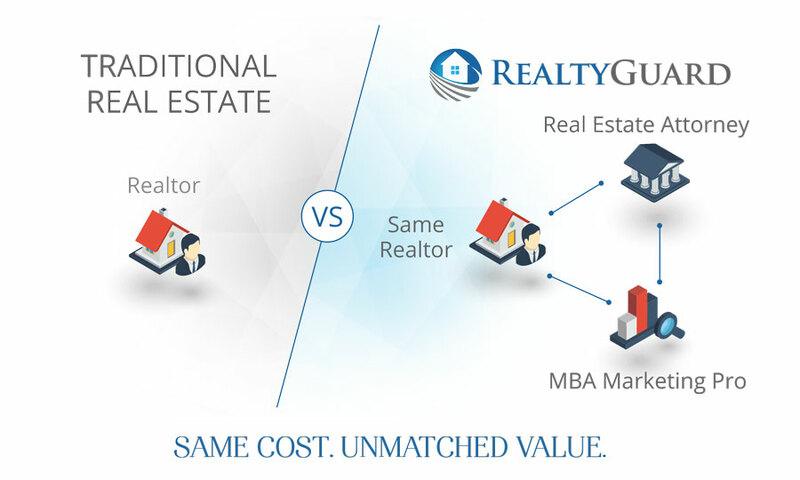 Imagine having MBA-educated marketing professionals working with your Realtor to truly set your home apart from the competition. That's what you get with Realty Guard! How It Works, and Why It COSTS YOU NOTHING! There’s too much at stake when selling a home to not get the absolute best representation. Realty Guard ensures that your home is marketed by MBA-educated marketing professionals that will help you sell faster, and at a higher price. When you sell a home with Realty Guard, you not only get the representation of the Realtor of your choice, you’ll get the representation of your own licensed real estate attorney, as well as the services of a professional marketing firm to help SELL FASTER, and at a HIGHER PRICE! When you sell your home with a Realtor, you typically pay a standard 6% commission to your agent that he or she splits with the buyer’s agent. Realty Guard is a service that your seller’s agent is happy to pay out of their commission because we’re making their jobs much easier and getting you the best results. This is a standard practice in the industry. Realty Guard then pays for the attorney and marketing fees out of their portion of the commission split. This is why it doesn’t cost you a penny more to use Realty Guard! Did You Know Realty Guard Will Pick Up Your Restaurant Tab! One of the most stressful parts of selling a home is trying to keep it clean all the time, as well as showings that always seem to fall during mealtimes! Well don’t sweat it. We’ll give you $100s in restaurant gift certificates that you can use anytime you want. Whether you have a showing around dinner time, or you just don’t want to clean your kitchen again, enjoy the evening out on us with your family! MBA-Educated Marketing Pros Can Help! When selling a home with Realty Guard, you and your agent get the added support from a professional marketing team to help set your home apart from the competition! We make sure you have custom-designed brochures by experienced graphic designers, access to the latest technology, effective social media campaigns to get the most exposure for your home, and more!